Product or Solution Partner not yet engaged. Please return soon for details. Steendyk’s ideas emerge out of an objective analysis of contemporary problems and the studio approaches design with the rigour of the perfectionist. “The challenge in design is to strip back and reduce a problem to its essence. To imbue a piece with artistic or sculptural beauty, while preserving its fundamental functional aspects, takes careful consideration.” The method is one of purification. Brian Steendyk can be contacted on +61 7 3839 0400 or at contact@steendyk.com. Bamboo Down Under - the “Enviro-Cottage” choice for supply of bamboos to the project, because they are knowledgeable, local and reliable and deliver great value. BAMBOO - EDIBLE - USEFUL - BEAUTIFUL!! Bamboos are giant grasses! They provide strong and lightweight timber for building and furniture construction. The varied types, textures, colours and width of the many species can be easily woven into finely crafted baskets, hats and screens. Many are also a source of edible shoots. Bamboo pulp can even be made into everything from paper to durable clothing! Bamboo makes great windbreaks, noise barriers and screens – the requirement of the Spring Hill “Enviro-Cottage” Project. They are useful for soil stability on dam walls and river banks. Due to their ability to rapidly increase their biomass, they are efficient clean air plants. Once established, bamboo is a drought tolerant plant. Come and encounter Australia’s Ultimate Bamboo Experience!! Bamboo Down Under have a large range of non-invasive clumping bamboos available to enhance your home and garden. Nosy neighbours? Do you need a hedge in a hurry? Or just a beautiful bamboo to enhance your garden? 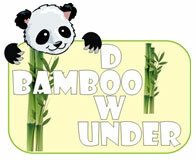 The Bamboo Down Under website will provide useful information about the many different aspects of bamboo. 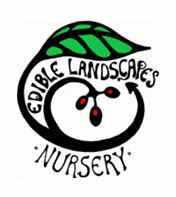 They would also love you to visit at their amazing nursery at Wongawallan on the Gold Coast. Whether you’re in the mood for a relaxing day trip or in need of some expert advice, go and visit and delight in the beauty and atmosphere. For further advice on all things bamboo, contact the Bamboo Down Under knowledgeable and friendly staff who will be very pleased to answer any of your questions. Phone Wholesale (07) 55 302 621 or Retail (07) 55 731 844, email Wholesale sales@bamboodownunder.com.au or Retail retail@bamboodownunder.com.au or visit www.bamboodownunder.com.au. Argent is the sole distributor in Australia of world-renowned bathroom brands Grohe, Villeroy & Boch, Bette and Pomd’or. For over 50 years Argent, has been supplying the bathrooms of Australia with the highest quality tapware, sanitaryware, baths and accessories available. Argent is proud to represent these brands which all have an excellent reputation for environment awareness, and have always been on-the-front-foot in water conservation and ethical practice. A number of these products have been used in the three bathrooms of the Spring Hill “Enviro-Cottage” Project, making an important contribution to the overall water management design. When designing a bathroom with the environment in mind, there are many Argent products to choose from that will not only save on water-use, but also reduce energy consumption which together equals less environmental impact and reduced running costs. For instance Grohe in-wall flushing systems are now available with a 4.5 litre full-flush and 3 Litre half-flush attracting a WELS 4 star rating. There are also a wide range of 5 & 6 Star rated basin mixers available as well as water smart showers. All Grohe products feature integrated water saving technologies and designs such as; flow-restricting cartridges, low flow aerators and eco options, allowing consumers to reduce water consumption without sacrificing performance or design. Grohe is renowned for its dedication to the environment which drives their constantly evolving innovations and designs. Villeroy & Boch’s commitment to ecological sustainability is reflected not only through their products but also throughout their production processes. 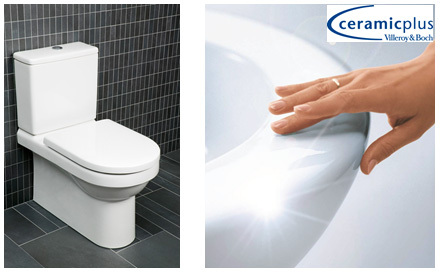 To eliminate the need for aggressive cleaning agents, Villeroy & Boch have developed their patented CeramicPlus finish. Available on most toilets and basins sold in Australia, this easy-clean option means less harmful chemicals are entering the environment and less water is used for cleaning. Villeroy & Boch also offer a range of water-saving 4.5 litre full-flush and 3 Litre half-flush (4 Star WELS rated) toilets, like those used in the Spring Hill “Enviro-Cottage” Project. 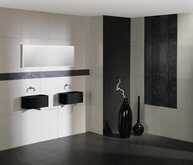 You can see a comprehensive range of the Argent bathroomware products at Bretts Architectural at Windsor. Bretts Architectural is the place to investigate the environmentally sound and technical requirements of a modern bathroom. You can test-drive many of the different Argent products in store and talk to Bretts’ professional consultants to simplify the bathroomware selection process. For more information phone Argent on 1300 364 748, email ac@argentaust.com.au or visit www.argentaust.com.au or phone Bretts Architectural on (07) 3361 0540, email showroom@bretts.com.au or visit www.bretts.com.au. Edsel Ford has been selected as the primary building contractor for the Spring Hill "Enviro-Cottage" Project. Edsel Ford has been in the building industry for more than 40 years and has delivered projects in many parts of the country. A lot of recent activity has been in rural Queensland where sustainable and efficient building practices and water and energy sustainability principles have always been part of people's thinking, for practical as well as commercial and environmental reasons. Edsel Ford and Pro Tem Consultancy services most recently teamed up in 2005 to win the Master Builders Award for Home Renovation ($150,000-$300,000). For more information phone Edsel on 0409 490408. Universal Fans have provided all Ceiling Fans to the Spring Hill “Enviro-Cottage”. With the passive solar design principles implemented and careful use of cross ventilation opportunities, the only additional mechanical heating or cooling required at the “Enviro-Cottage” is through use of the ceiling fans. Ceiling fans are very cost effective. They cost less than one cent an hour to run compared to 30 to 40 cents an hour for a typical air conditioner. Ceiling fans are also a great option for overnight use in bedrooms during summer. Assessments made have shown that a split-system air-conditioner used for four hours a day over summer produces 0.86 tonnes of carbon dioxide each year and costs 27 cents an hour to run. Ducted refrigerated air-conditioning produces 2.85 tonnes a year and costs 87 cents an hour. A fan produces only 0.03 tonnes and costs less than a cent an hour to run. Hunter Pacific Concept Two, Australian Designed, White and Brushed Aluminium Fans with summer and winter settings. Hunter Pacific Icon 54’, Australian Designed, Black and Brushed Aluminium Fans. For more information on these fans and newer models which are even more energy efficient, contact Universal Fans on 1300 175 133, email brisbane@universalfans.com.au or visit www.universalfans.com.au. 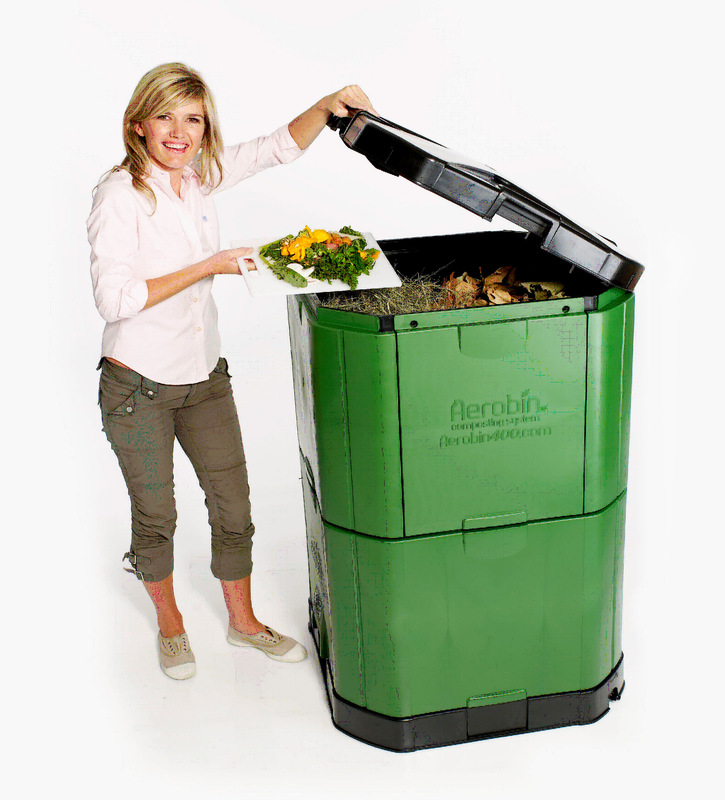 The Aerobin is the latest home composting system. It recycles kitchen scraps, green garden waste and paper, into rich, fertile compost that can be returned to your garden to help other plant life grow. 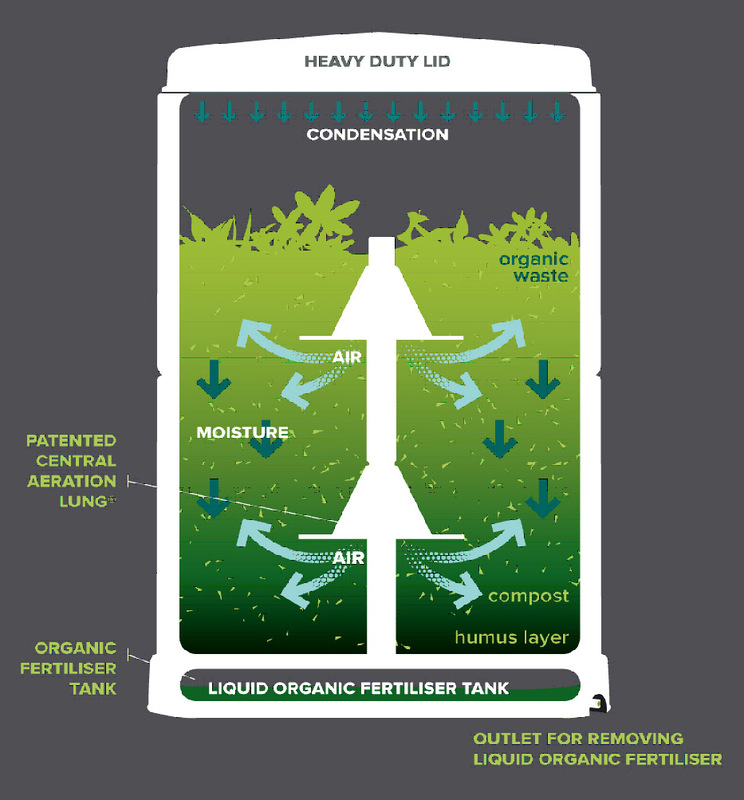 A technological breakthrough - it uses a patented “lung” or aeration core within an insulated bin to promote aerobic and efficient break down of organic matter, which contributes to the reduction of greenhouse gas emissions – an important factor in addressing climate change. Clean Up Australia reports that home composting diverts the amount of organic waste going to the tip by 50%. The Aerobin is so easy to use – just open the lid, drop in organic waste and close. After a short time fertile compost is produced, which is easily accessed at either side. The Aerobin is the perfect environment for hot composting. Hot composting is desirable because it kills pathogens, inoculates weeds and seeds and creates good quality compost in a short time. A variety of materials such as food scraps (including onion and citrus), tea leaves, lawn clippings, leaves, twigs and even newspaper (scrunched) will encourage microbial action to produce compost. The thermal insulation in the Aerobin stabilises temperature, beneficial to microbial action year round. Developed by an Australian company, this new technology provides a simple way to reduce your carbon footprint. The unit has been tested by the Swinburne University of Technology, Environment and Biotechnology Centre in Victoria and was found to produce the best quality compost. The Aerobin has a 400kg capacity and measures 740mm x 740mm x 1200mm. Available at better Nurseries, Garden Centres and Hardware Stores. The Queensland Government provides a $50 water rebate to purchasers of the Aerobin. For your nearest supplier and other information go to www.aerobin.com.au, email info@aerobin.com.au, or call 1800 615 445. G.James Glass Aluminium is a leading supplier of quality aluminium windows and doors servicing all sectors of the building and construction market. Serviced by an extensive network of in-house extrusion, glass processing and fabrication facilities, this Australian owned company leads the way in product development and service capability. Established in 1917, G.James is well respected within the building industry for their comprehensive range, value-for-money products, and customer satisfaction. With the increasing demand for more energy efficient glazing products, G.James welcomes the challenge and goals set by the “Enviro-Cottage” as a way of further cementing their reputation in this area. G.James residential extrusions are manufactured in Australia from billet produced using recycled aluminium. This billet requires approx 90% less power to produce than primary billet. The “Enviro-Cottage” is also using G.James Solect® Laminated Glass in most windows. Ordinary windows and glass can be a major source of undesirable heat gain in summer and heat loss in winter. 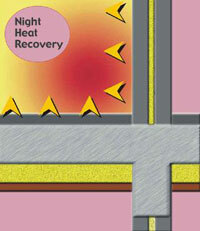 G.James Solect® glass reduces both heat gain and heat loss, creating an increased level of comfort all year round. The G.James windows are an important contributor to the thermal comfort of the “Enviro-Cottage” and one of the reasons air conditioning is not required in this house. For your nearest supplier and other information go to www.gjames.com.au, email hilite@gjames.com.au, or call 07 3877 2844. As the number one manufacturer of electrical accessories in Australia, and as a member of the Schneider Electric family – the world leader in electrical accessories, Clipsal Australia recognises the responsibility they have in coupling good business with good environmental outcomes. Caring for the environment and the pursuit of sustainability has always been good business practice. With environmental issues now more topical than ever before, Clipsal has worked hard in recent times to maintain and improve their high environmental standards as their business continues to grow. They have invested a great deal in planning, training, communication and continuously identifying areas in which they can reduce, control and eliminate environmental risks. Clipsal Australia is committed to supporting the global strategy of achieving a more environmentally conscious and efficient society. Clipsal provide a portfolio of energy efficient solutions aimed at helping everyone to do their part towards the global objective of being more energy efficient and conscious of the environment. Add to this their commitment to environmentally friendly product design and their ISO 14001 Certification and it’s easy to see that they’re not just talking like a leader, but acting like one. Clipsal’s range of innovative and environmental product solutions include intelligent lighting control, dimmers, efficient lighting, ceiling fans, exhaust fans, motion sensors, daylight sensors, timer switches, and energy usage meters to name a few, many of which are utilised within the Spring Hill “Enviro-Cottage” Project. For further information on Clipsal’s extensive range of innovative environmental product solutions please visit www.clipsal.com, call 1300 2025 25 or email www.clipsal.com/feedback. Electra Technologies have delivered all the electrical design and installation services to the Spring Hill “Enviro-Cottage” including all LED lighting, security, data networking, telephony and television services. They are a Philips certified master contractor. 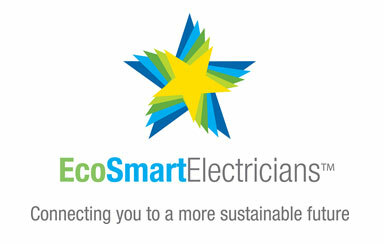 Electra Technologies are accredited EcoSmart electricians, so they can assist with sustainability advice and environmentally aware electrical design options. 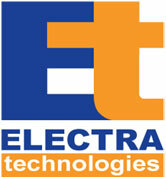 For more information on all EcoSmart and other general electrical services, contact Electra Technologies on 0404 854846, email sales@electratechnologies.com.au or visit www.electratechnologies.com.au. The Vental R80 external louvre blinds have been supplied and fitted by Dove Industry. The external blinds preclude sun access to the “Enviro-Cottage” thermal mass concrete floor during summer, although the tilting operation allows reflective light to access the "Enviro-Cottage" when required. The blinds can also be opened at night for a view of the stars and to allow solar access to the thermal mass during winter days to ensure no additional mechanical heating is required to maintain a comfortable internal temperature. For more information phone Dove Industry on 07 3878 8839 or email michael@doveindustry.com.au. 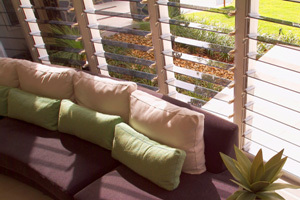 Information on Vental Blinds can be viewed at www.vental.com.au. Wildwood Timber Floors sanded and finished all the original and recycled hardwood timber flooring at the Spring Hill “Enviro-Cottage”. Wildwood’s unique range of timber floors can fit your unique style and space. From intricate heritage parquetry to stunning wide board and recycled hardwoods. The managing director, Roy Miller, has been working in the timber flooring and cork industry for over 38 years and so has built up a vast knowledge of products, procedures and installation techniques. The standard of the Wildwood’s work is consistent, efficient and highly professional. For the “Enviro-Cottage”, Wildwood finished the timber floors with hard wax oil from Whittle Waxes. Whittle Waxes is the first Australian company dedicated to promoting premium natural oils and waxes for the protection and enhancement of all timber surfaces. They are committed to providing the best timber care and protection without having a harmful impact on your health or the environment. For more information on all aspects of timber flooring, contact Wildwood Timber Floors on (07) 3369 2698, email sales@wildwoodflooring.com.au or visit www.wildwoodflooring.com.au. For information on Whittle Waxes phone 1300 326 929, email info@whittlewaxes.com.au, or visit www.whittlewaxes.com.au. 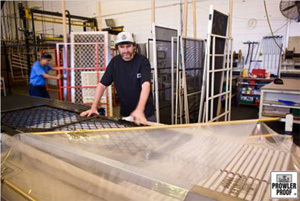 For over 25 years, Prowler Proof, now located at Banyo in Brisbane, has either been retailing, manufacturing or wholesaling custom-made security doors and window screens. Today, Prowler Proof manufactures and wholesales to over 250 dealers from as far north as Cairns to as far south as Canberra. Through innovation Prowler Proof has been able to develop and implement systems which allow Prowler Proof to deliver more sustainable production processes. Technology has enabled Prowler Proof to take a more customer centric approach to the enormous amount of product variability requests while still meeting mass production economies of scale. 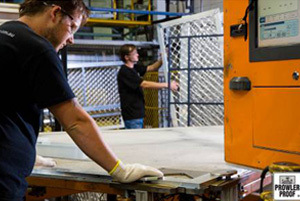 By investing in innovation and technology, Prowler Proof has been able to manufacture security doors and window screens that offer Strength, Reliability, Quality, Finish and Value at the core of every product made. Prowler Proof has successfully applied technology through e-business systems, production automation, Information and Communication Technology (ICT) and uniquely designed products to move the production processes from custom made to mass customisation. Through investment and simplification of this technology, Prowler Proof has been able to leverage these innovations to simplify production processes and implement quality systems which ensure a higher quality product, whilst ensuring an average product turnaround time of 3 days, with less material wastage. Prowler Proof's investment in innovation has seen them nominated as Finalists in two categories for the Telstra Business Awards for the Panasonic Australia Medium Business Award 2008 and the AMP Innovation Award 2008. Prowler Proof supplies welded security doors and window screens in over 200 colours. All are made to measure to suit any home. All of the Prowler Proof products have a large range of manufactured options and upgrades available from different insect screen gauzes, lock guards, door furniture, pet doors and port holes. Just ask your friendly local authorised dealer about which option will best suit your needs. Simpler more compact lifestyles are forcing todays trends towards double duty furnishings. By installing a wall bed and converting valuable floor space into wall space, you can now reclaim that rarely used guest room or spare bedroom and transform it into an efficient home office, home theatre or workroom. 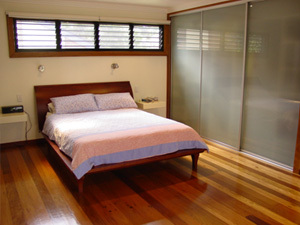 Bed Space Design manufacture here in Australia, ensuring high quality workmanship and materials. Our wall beds come in a range of Melamine finishes from plain colours to wood grain textures that will complement most decors. Timber veneer finishes are also available. We use only quality German made hinges/gas strut systems, which come with a lifetime guarantee and make the bed easy to operate, transforming your spare room into a bedroom in seconds. The bed structure is not bolted to the floor, but is simply screwed to the wall in two places. This eliminates the process of drilling multiple large holes through floor coverings and into timber or concrete floors, which are very difficult and expensive to repair if the bed is to be moved. Unlike many designs on the market our wall beds do not have folding doors. Folding doors tend to stick out and get in the way in a small room when the beds are opened, and also give the feeling that one is sleeping in a box when lying in the bed. We have included a bed head in our design, which in combination with the positioning of our bed base, eliminates the problem of losing your pillows over the back of the bed, a common problem with some wall beds. Coordinating side cabinets are available as an additional feature. All of our side cabinets come with a slide out shelf that serves as a bedside table, making that alarm clock, book or cup of coffee easily accessible when the bed is in the down position. An ironing station, complete with fold out ironing board is also available for those who like to do their ironing in the spare bedroom. Wall beds are traditionally expensive, but at Bed Space Design we have used our vast experience in bedroom furniture design to make our wall bed very affordable. You will also be dealing direct with the manufacturer, thus removing the middleman from the pricing equation. Bed Space Design makes a major contribution to the social sustainability principles of the Spring Hill Enviro-Cottage Project. King Furniture is an Australian organisation which has designed and manufactured contemporary, award-winning furniture since 1977. King Furniture uses clever design with a meticulous focus on flexibility, quality and comfort, with the environmental impact of their products and services always considered. King Furniture has been environmentally aware and active right from day one - unlike organisations who decide to claim environmental sensitivity just because it is fashionable. When you buy King Furniture you can confidently share in a greener future. King Furniture is justifiably proud of the public awards and acknowledgement it has received environmental care and work processes. Its first ‘green’ award was bestowed over a decade ago (FMIAA and NSW Environment Protection Authority Award 1999). The company uses recyclable and biodegradable materials wherever possible, including in the steel frames and cushioning. Unlike conventional sofas, durable steel frames ensure that King sofas are built to last and also enable sofas to be recovered so that they do not end up in landfill. The removable leather and fabric covers allow for cleaning, or a seasonal or generational change of decor. The removable cover system also means that all components can be easily separated for recycling. King Furniture’s adaptable designs ensure longevity and minimise potential landfill, as they can be moved into different seating arrangements and altered to suit changing tastes. King Furniture’s King-Care service professionally cleans and protects and extends the life of all sofas. All sofa components are easily assembled without tools, allowing for transportation in nearly half the space of conventional sofas. This results in a substantial reduction in carbon miles. The King Furniture environmental initiatives don’t end here – as new environmentally friendly opportunities arise the King Furniture team finds ways to improve processes and materials to make things even better. All King sofas are built around a unique recyclable steel frame and POSTUREFLEX® seating system that are engineered to provide unsurpassed support and durability. This same seating system is used in luxury European cars. Advanced modular systems enable numerous seating configurations; while high density cushions offer superior long lasting comfort. A number of designs incorporate convenient storage or adjustable feet to alter the height and seating angle to personal preferences. Premium leathers and fabrics are hand-selected from the finest tanneries and fabric houses. The company manufactures its extensive range in Sydney and at its Australian-owned factory in Shanghai, and now operates eleven showrooms across New South Wales, Victoria, Queensland and ACT. For more information on King Furniture call 1300 KINGFURNITURE, email info@kingfurniture.com.au or visit www.kingfurniture.com. The social sustainability principles of the Spring Hill “Enviro-Cottage” project are supported by the use of the Selections™ One Way Mesh garage door, as it provides good visibility to the street while providing privacy from outside in. Good ventilation is also supported through the garage door mesh to assist with natural clothes drying in the laundry area. The Selections™ One Way Mesh differs through the use of uniquely crafted small dimension mesh which offers greater visibility from inside looking out than from the aspect of outside looking in, allowing for ventilation and light without the complete openness of a larger diameter mesh door. For more information contact Reliance Door Service on 1300 280 620, email info@reliancedoorservice.com.au or visit www.reliancedoorservice.com.au. G.James Glass & Aluminium is a leading supplier of quality aluminium windows and doors servicing all sectors of the building and construction market. Serviced by an extensive network of in-house extrusion, glass processing and fabrication facilities, this Australian owned company leads the way in product development and service capability. The NovaGrey is designed to safely recycle household grey water for reuse in your home and garden. Manufactured by WaterGurus - the SafeWater Company - the NovaGrey allows its owners to efficiently recycle up to 1100 litres of household grey water each day, reducing your household water bills and your environmental footprint. The NovaGrey can recycle your household grey water to a very safe re-usable standard, enabling you to use it to flush household toilets, for garden irrigation, external hosing, and even clothes washing in the laundry, subject to your local regulations. Available now, the NovaGrey is available in 3 popular colours - Slate Grey, RiverGum Green and Beige. For more information visit www.watergurus.com.au, call 1300 NOVACLEAR (1300 668225), or email info@watergurus.com.au. Installing the NovaGrey system at the Spring Hill "Enviro-Cottage". Installing high quality gutter protection is critical to ensuring long term low maintenance performance and to protect the value of your home. Blue Mountain Mesh™ is an innovative mesh system that prevents leaves and debris entering the Spring Hill “Enviro-Cottage” gutters. The mesh fits from the top outside edge of the gutter, across the gutter section and is then attached to the roof surface. This creates a platform that suspends leaves and debris above the roof gutter, allowing the majority of leaves and other flammable material build-up to be blown away by wind action. Blue Mountain Mesh™ prevents blocked gutters and downpipes which can cause flooding and damage to the home. By keeping roof gutters clean and clear of leaf build up, Blue Mountain Mesh™ ensures gutters dry out quickly after rain. Dry gutters last longer, require less maintenance and eliminate potential mosquito breeding habitats. 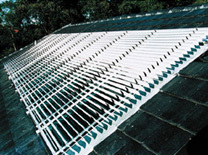 Blue Mountain Mesh™ can be easily removed and reinstalled if gutters are to be replaced. Blue Mountain Mesh™ not only keeps out debris, it also prevents vermin from entering the roof and ceiling area of the home. It even prevents the loss of stray backyard cricket balls and toys. Blue Mountain Mesh™ is a safe solution reducing the risk associated with climbing ladders to clean out your gutters. The Blue Mountain Mesh™ provides the first level of filtering for the Spring Hill “Enviro-Cottage” drinking water system. THE PREMIUM GUTTER PROTECTION SOLUTION FOR ALL ROOFS. Rain Harvesting also deliver a Tank Vacuum System amongst other innovative rain harvesting products. The Tank Vacuum System is a great addition to a rainwater harvesting system preventing fine sediment, which can contain harmful bacteria and heavy metals, building up on the bottom of rainwater tanks. The Tank Vacuum System automatically vacuums the sediment off the bottom of the tank in the area of the outtake pipe every time the tank overflows. This prevents sediment from being drawn out through the outtake pipe for re-use. The systems are supplied in kit form and fit all types of tanks, including metal, plastic, concrete and fibreglass. For your nearest supplier and other information go to www.rainharvesting.com.au, email info@rainharvesting.com.au, or call 1800 06 77 44. The Redwater Diverter saves the cool water from the hot tap that is normally wasted down the drain while waiting for hot water to arrive. The Redwater Diverter valve has been designed in the interests of sustainability and is considered to be current best practice. To take full advantage of this inspired invention, the Redwater Diverter system should be installed in high hot water usage areas. The most obvious is the kitchen sink, where hot water is often used throughout the day. Commonly the water must travel a long distance to reach the tap, thereby wasting a large amount of cooled water. Due to the clever compact design the Redwater Diverter can be installed in the cupboard below the tap, under the floor, in the ceiling space, or in a commercial situation in service ducts provided. Another example of a high hot water usage area is the bathroom. 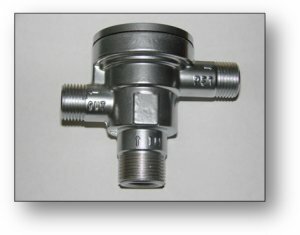 In this case a Redwater Diverter could be installed to service multiple fixtures such as the shower and basin, or individually service a single fixture. The Redwater Diverter is currently undergoing testing to Australian Standard 1357.2. "This device, I believe, is well thought out and particularly interesting in that it does not use energy"
"A truly innovative product, I love it so much I want one in my own home"
Jim McKnoulty - Brisbane Resident. "It is the most economical way of saving the water in its field, it is easy to install - every home owner should want one!" 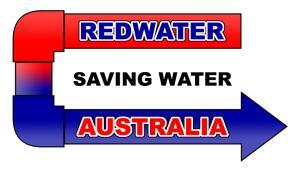 The Redwater Diverter is an Australian owned, invented and manufactured product that is patented in Australia and several other countries. Higgins Real Wool insulation is a safe, non toxic, non itchy, formaldehyde free insulation alternative that has low embodied energy and has been proven to outperform other insulation materials. Improve comfort A properly insulated home will be cooler in summer and warmer in winter, improving the comfort and liveability of your home all year round. Help protect the environment When less fuel is used for heating and cooling, less carbon dioxide is added to the atmosphere. Home insulation can help to substantially reduce greenhouse gas emissions and also conserve our precious non-renewable energy resources. Due to wools intricate natural structure it has many advantages over man-made fibres. Research shows that wool performs better as an insulator because as a natural fibre it has the ability to trap large columns of air, providing a higher thermal resistance. Wool has an inherent ability to interact with the atmosphere, absorbing and de-sorbing moisture from the air in your roof cavity over the cycle of day and night. Essentially, as the temperature drops through the night, the air in your roof cavity becomes moist. Wool will absorb this moisture and hold it. As the sun comes up and heat in your roof cavity builds up, the heat begins to act upon your bulk insulation. Eventually there comes a point when other insulators will reach heat saturation and the heat starts to penetrate into your home. Wool on the other hand will start to desorb the moisture it has collected from the air overnight, allowing the fibre mass to stay cool for much longer. The net result is that your home will be cooler in summer and warmer in winter by up to 6 degrees. As wool interacts with the atmosphere it also absorbs and traps toxins and other impurities from the air in your home, making it perfect for asthma or allergy sufferers. Wool is a totally renewable resource, has possibly the lowest embodied energy of any insulation product, has a Zero Ozone Depletion Potential, a Low Volatile Organic Compound rating, and contains no Formaldehyde making it possibly the most environmental insulation product on the planet! Higgins Insulation is an Australian owned company with a brand history of 15 years and a proven track record of supplying superior insulation products and services for projects as diverse a single home renovations, multi story apartments and larger commercial undertakings such as the Sydney 2000 Olympic village and other government projects. For more information please see Higgins, or email sales@higginsinsulation.com.au. Energy Star insulating roof paint provided by Astec Paints Queensland is a 100% acrylic, infrared heat reflective coating designed using colour infused nano-ceramics as a heat reflective mechanism. Energy Star is the only paint to comply with Section J of the BCA regarding energy efficiency. It is backed by "Good Environmental Choice" labelling and it also has achieved “Energy Star” accreditation from the Environmental Protection Agency. By incorporating Energy Star tables on solar absorption etc. an equivalent r-value can be obtained. By using this system, you can either supplement or eliminate the requirement of internal insulation, thus saving you money and obtaining more useable floor space. The Energy Star paint is used on the “Enviro-Cottage” roof, but it can also be applied to exterior walls and eliminate the equivalent requirement of the 27mm air channel and 10mm Gyprock wall. 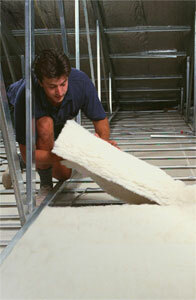 This can save big dollars and time – saving up to $28.00/m2 on insulation costs and delivering extra useable floor space. Energy Star carries a 15 year warranty and has a life expectancy in excess of 22.5 years. Energy Star is available in a range of 44 colours. It can be applied onto various substrates such as metal, tiles, asbestos, concrete, brick, block, render, timber etc. It also comes in a waterproofing version. For your nearest supplier and other information go to www.astecpaints.com.au, email mail@astecpaintsqld.com.au, or call 07 3865 7333. Greener Kitchens + Bathrooms designs, manufactures and installs new kitchens and bathrooms with a commitment to more sustainable solutions. The company uses carefully chosen innovative products that are environmentally sensitive, healthier and ethically produced. This includes materials that have been recycled, are recyclable, have low emissions and can save on energy and water use. Greener Kitchens + Bathrooms take steps to deal with waste (such as old kitchens they are asked to remove) in a responsible way and go about the installation of their projects with the environment and indoor air quality very much in mind. 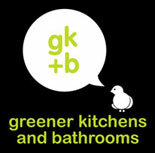 Greener Kitchens + Bathrooms unique approach has recently been featured in Home Beautiful Magazine, Green (Sustainable Architecture) Magazine and Map Magazine to name a few. They are also proud to be supporters of important local projects like the building of Yarran Downs Station, a base from where the local endangered hairy nose Wombat population is being protected. Being the most renovated and resource thirsty rooms in the home makes a ‘greener’ kitchen or bathroom a prudent choice for those improving an existing home, building a new one or protecting wombats! 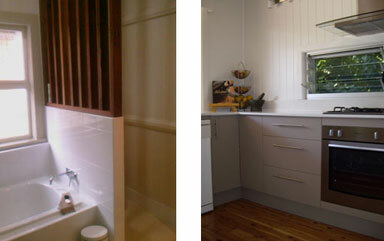 Currently Greener Kitchens + Bathrooms is undertaking projects in Brisbane, Northern New South Wales and Sydney. For more information phone Druce on 0430 096 216 or email to druce@greenerkitchens.com.au or visit the website www.greenerkitchens.com.au. Miele’s motto “Forever Better” also applies to the company’s green credentials. For the last 100 years, Miele’s ongoing commitment to conserving resources and economising raw materials has been evident in the innovation and development as well as the durability and longevity of its appliances. Clearly, the longer the operational life of a product, the less likely the need for new materials and the energy required in producing a replacement. In fact, Miele was the first appliance manufacturer worldwide to receive the Environment Standard DIN EN ISO 14001 certification for all its German factories in 1996. The certification recognises Miele’s commitment to the environment by continually striving to improve appliance performance, adhering to environmental standards within production, and reducing packaging. Using only "as much as necessary, but as little as possible", all Miele packaging is designed to be recyclable. Due to their high metal content, Miele's large appliances are amongst the most recyclable in the world. All plastic components are marked so that they can be manually sorted at the end of an appliance's life. Since 2005, the use of energy-saving lamps and light bulbs are common place throughout the entire company, cutting energy costs by up to 80%. When it comes to products, the insulation material and coolants used in Miele's refrigeration products were converted to CFC-free and HFC-free materials long before guidelines on banning CFC’s and HFC’s came into force. This ensures there is no further damage to the ozone layer or increase in the greenhouse effect. In the kitchen, Miele ovens achieve the highest energy efficiency ratings in Europe, ensuring exceptional performance and energy saving. Miele dishwashers, with intelligent load sensing technology, are designed to help cut water consumption by more than half when compared to doing the same wash by hand. When connected to a highly efficient solar hot water supply, the appliances allow for a reduction of up to a third in energy consumption and greenhouse gas emissions. In the laundry, developments are underway to take advantage of emerging heat pump technology which has the potential to reduce energy consumption and thus Greenhouse gas emissions by up to 46% when compared with conventional condenser dryers. From November 2008, all Miele washing machines on the Australian market have had a 4½-star WELS water efficiency rating and a minimum 4-star energy rating. There is no question that Miele makes very economical use of Australia’s and the world’s precious resources through a long-lasting commitment to environmental sustainability. See a comprehensive range of the Miele ovens, cooktops, rangehoods, microwaves, dishwashers, coffee machines and fridges installed in a full-sized and functional display kitchen at Bretts Architectural at Windsor. Bretts Architectural is the place to investigate the environmentally sound and technical requirements of a modern kitchen. You can test-drive many of the different products in the demonstrator kitchens and talk to Bretts’ professional consultants to simplify the appliance selection process. For more information phone Miele on (07) 3632 2471, email sales@miele.com.au or visit www.miele.com.au or the Miele architectural website www.mielebim.com.au or phone Bretts Architectural on (07) 3361 0540, email showroom@bretts.com.au or visit www.bretts.com.au. 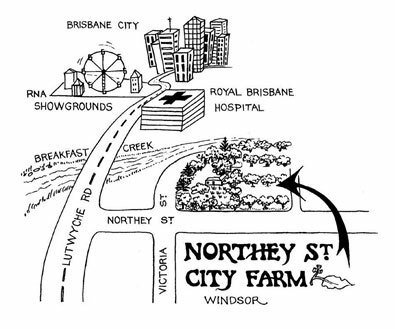 Northey Street City Farm is a non-profit community organisation situated on the banks of Brisbane’s Breakfast Creek in Windsor. The Northey Street design, landscaping and nursery teams have designed and installed the edible garden at the front of the Spring Hill “Enviro-Cottage”. The city farm has been developed for people to enjoy and participate in using the principles of permaculture. It is also intended to be a demonstration site where people of all ages can learn through practical, hands on experience. The mission of the Northey Street City Farm is to create a working model of a cooperative, community based urban permaculture farm which demonstrates, promotes, educates and advocates for environmental and economic sustainability in a healthy, diverse and supportive community. The Northey Street Organic Markets run every Sunday morning from 6:00am-10:30am. Arcadia Turf has provided drought tolerant Empire Zoysia grass to the Spring Hill “Enviro-Cottage”. Empire Zoysia is a good environmental choice as it requires less mowing and low to no irrigation. It has shown an ability to go dormant with drought stress, yet return to great condition quickly after rain. This feature allows the grass to go long periods without requiring irrigation. In this case the lawn is planted on top of the “Enviro-Cottage” Atlantis underground water tank, benefitting from transpiration of the water from the underground open topped tank, minimising any ongoing hand watering requirement. Empire Zoysia is easy to look after, good at out competing weeds, and requires less mowing than most other commercially grown lawns in Australia. It is low thatching, less scalping, good in the shade, good to moderate winter colour and a relatively finer leaf (5mm-6mm blade width). Empire Zoysia has a massive and dense root system (see picture above), far more extensive than Couch. These deep, tough rhizomes provide Empire Zoysia with its unmatched survivability. It's a strong grass that can take a lot of wear and tear, yet requires very little mowing. In a no mow study, after being left for 20 weeks without mowing, Empire Zoysia only grew 117mm compared to Kikuyu which grew 435mm and Couch 205mm. Empire Zoysia thrives in hot, humid or desert areas, but also has excellent cold tolerance. It can cope with temperatures from -40°C to +40°C. Normal mowing height is 25mm-60mm, but can also be mowed down to 12mm-25mm when maintained like a bowling green. 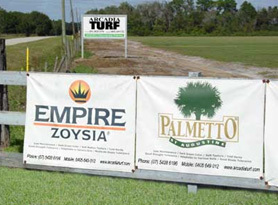 Empire Zoysia requires much less mowing than other turf types. This reduces carbon emissions from mower use and cuts costs dramatically if you are hiring a mowing contractor. For more information on Empire Zoysia, other drought tolerant and enviro-sensitive lawns and other landscaping requirements contact Arcadia Turf on (07) 5428 6196 or 0405 649 012, email troy@arcadiaturf.com or visit www.arcadiaturf.com.au. You can also visit the Arcadia Turf Display Centre at Unit 20, 39 Aerodrome Rd Caboolture, to see these turf varieties for yourself and talk directly to the experts. Light is a fundamental part of life. It gives us the natural rhythm of day and night, determines how we see things and brings the world to life. Accordingly, light has a major impact on our well-being, moods and emotions. With light, we can uplift and inspire, we can comfort and heal, we can create safety and spectacle. Each year, Philips invests heavily in research to gather end-user insights, further deepening their understanding of people’s needs, desires and aspirations. Combining these insights with their technological leadership, they are able to deliver meaningful innovations – advanced, energy-efficient products and systems that are designed around people and are easy to experience. Solutions, therefore, that will help us all create a sustainable future. A wide range of Philips Energy Efficient lighting solutions have been installed in the Spring Hill “Enviro-Cottage” Project, from LED (Light Emitting Diode) lights, to Energy Savers (CFLs), creating an inspiring and uplifting ambience, while maintaining minimum overall energy use in the home. In fact, the total lighting solution delivered by Philips for the “Enviro-Cottage”, both internal and external, totals less than 1,000 watts or the equivalent of 16 x 60 watt standard light globes. No other company has the breadth and depth in all aspects of the Lighting industry. Philips offer the complete lighting product portfolio in order to be able to deliver solutions that address the real needs of the people they serve. From Lamps, Lighting Electronics, LED components and modules, to professional and consumer luminaires to Automotive applications. From architects to lighting designers, city planners to public authorities, and to consumers – Philips are in a tremendous position to maximize the innovation and understanding they have built up over 118 years. And as a long-time market leader, Philips strives to make the best use of the opportunities for lighting to achieve lasting change in many aspects of life. For more information contact Philips on 1300 304 404, email lightingsalesdesk@philips.com or visit www.philips.com.au/lighting. 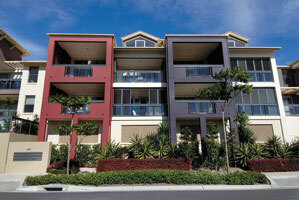 The Natural Painting People are Brisbane's greenest painters with years of experience in the painting trade. They have been successfully advocating for a greener and healthier approach to painting in Brisbane and are members of the Master Painters Queensland and the GreenPainters Association of Australia. Many paints contain Volatile Organic Compounds (VOC's) which are the solvents and chemicals that off gas as paints dry and are dangerous to our health. VOC's affect the applicator as they paint and affect customers after a job is finished as they can continue to off gas for months after application. For more information see the "Enviro-Cottage" green paint article here. In December 2007 the World Health Organisation's International Agency for Research on Cancer issued a press release declaring that occupational exposure as a painter is "carcinogenic to humans". The release linked the development of lung and bladder cancer with painting as an occupation and suggests that exposure in females may be associated with childhood leukaemia. Many customers also have adverse reactions to paint such as respiratory problems, eye irritation, and nausea. However, non toxic paints used by the Natural Painting People have a very low irritant value; one of the brands is the only paint in Australia to receive the Asthma Councils seal of approval! Ash Smith and the team at Natural Painting People use low and zero VOC paints from companies which have a whole of life cycle understanding regarding the manufacture of paint. These companies include Rockcote who produce Ecostyle paint and the Cooee range of products for wood (both manufactured on the Sunshine Coast). They also specialise in water wise principles and use a "paint reclaimer" to recycle paint waste off site, meaning dirty paint 'water' doesn't enter groundwater systems on site. The Natural Painting People have completed many quality projects around Brisbane and specialise in renovations and restoration work. 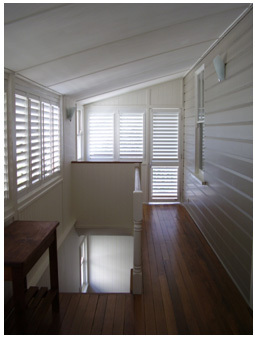 The workmanship undertaken is of highest quality and their knowledge of sustainable painting is unrivalled in Brisbane. Please contact the Natural Painting People for a free quote for your next painting project. When it comes to the finest quality render, texture and paint, ROCKCOTE has it covered. Whether you're an architect, builder, specifier or home renovator, ROCKCOTE can help you enhance your project with texture, colour and protection. Totally compatible with a wide range of building materials, ROCKCOTE's render, texture and paint systems allow you to express your individual style in a unique way - creating a signature look for your home, inside and out. If you're looking for an environmentally friendly paint, then ROCKCOTE's EcoStyle range is for you. This Zero VOC (Volatile Organic Compound) paint has no horrible smell, toxic chemicals or solvents. EcoStyle has been awarded the Good Environmental Choice Label and is approved by the National Asthma Council. From finding the perfect colour and finish, to planning your entire project, the experienced team of ROCKCOTE specialists can help you achieve the look and performance you're after. The solution is always easy with ROCKCOTE. Visit www.rockcote.com.au or call 1300 736 668 for your nearest Rockcote Centre or Stockist or email sales@rockcote.com.au. The Paint Place Sandgate has provided Rockcote paints to the Spring Hill “Enviro-Cottage”. Their product range includes Rockcote EcoStyle paint, approved by the National Asthma Council Australia, suitable for interior and exterior use and is developed and made on Queensland's Sunshine Coast. Make your colour choices create a comfortable home. Don’t think of colour as purely cosmetic. Colour combinations subconsciously affect your behaviour and mood. So why not choose cool colours like blues and greys for a sunny, hot room and warm up darker rooms with brown, yellow or red tones. This way your air conditioner might get less of a work out! Reduce top coats when using deeper colours. Try to reduce the number of top coats you’ll need by using a tinted undercoat. This way you reduce the amount of paint you need and the number of applications. Save water by rinsing brushes less often. Rather than rinsing brushes and rollers between each coat simply store them in a freezer bag which will prevent them drying out. Cleaning roller trays the easy way. Roller trays can be fiddly and difficult to clean. Try covering the tray in a degradable plastic bag before you paint. When you’ve finished painting simply peel off the bag and turn inside out and you save water and avoid the mess of cleaning paint off the tray. Be sure to let the paint waste dry completely before tossing in the bin. Remember only water-based (or acrylic) paints can be disposed of in your regular waste. Solvent-based paints are classed as hazardous chemical waste and need to be disposed of in your local council’s household hazardous chemical waste collection service. Be storage smart and keep paint fresh for the future. Avoid wastage by decanting leftover paint and storing in an old jar or other airtight container for future touch ups (remember to label the container clearly). For substantial amounts of leftover paint cover the top of the open can with cling wrap and put the lid on securely to avoid leakage. Store the can upside down. The paint naturally forms a skin which will help to seal the can and keep the paint fresh for next time. Donate leftover paint. Have you got old paint lying around in the shed? If the paint is in good condition why not donate it to a community group, charity or theatre company? For more information contact the Paint Place Sandgate on (07) 3869 1115, email wdaw8502@bigpond.net.au or visit www.paintplace.com.au. Eco-Kinetics has provided both the Photovoltaic and Solar Hot Water solutions to the Spring Hill "Enviro-Cottage" Project. Queensland based Eco-Kinetics Pty Ltd is focused on providing engineering services for clean and efficient energy solutions to the large and growing sustainable energy market in the Asia Pacific region. Since inception, Eco-Kinetics has identified market opportunities and projects through research, traditional marketing and through word of mouth. It has developed innovative solutions and secured client interest. Eco-Kinetics leads in the provision of quality engineered solutions with a clear focus on sustainable clean and renewable energy markets within in the Asia Pacific region. To become the premier clean and alternate energy engineering solutions firm in the Asia Pacific. Eco-Kinetics' core principles form the underpinning of how they work together to serve their clients. Service: Eco-Kinetics puts customers first. Staff strive to understand clients' needs and deliver cost-effective, sustainable solutions to meet those needs. Value: Eco-Kinetics takes on clients' problems as if they were their own. They develop and implement real-world solutions that are cost-effective, sustainable, efficient and practical. Excellence: Eco-Kinetics brings superior technical expertise, disciplined project management, and excellence in safety and quality to all work undertaken. Opportunity: Eco-Kinetics staff are their most valuable asset. Their workforce is diverse and includes experts in their specific fields. Their entrepreneurial nature and commitment to success provide challenges and opportunities for all involved. For more information visit www.eco-kinetics.com, call 07 3441 4200, or email info@eco-kinetics.com. Slade Brothers Plumbing provides plumbing services to the Northside of Brisbane, from the Brisbane city region north to Redcliffe. From fixing a dripping tap to major scheduled maintenance, including water efficiency and hot water solutions, Slade Bros are small enough to care and large enough to help. Slade Bros are qualified and licensed Green Plumbers®. Green Plumbers Licensed GreenPlumbers® can supply environmentally sustainable plumbing, construction work, services such as gas work, heating and cooling work or environmentally sustainable products. 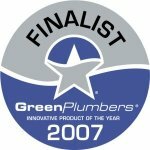 Using certified GreenPlumbers® means peace of mind for the customer, as they are required to adhere to a code of ethics and warrant their plumbing work. Slade Bros can provide an extensive range of services in the area of domestic, industrial and commercial plumbing maintenance. Slade Bros has completed a variety of shop fit-outs and has been involved in various renovation projects. Slade Bros can offer scheduled and pre-programmed maintenance services. They are able to tailor services to suit your requirements. They also offer a Hydro-Jet drain cleaning service. Slade Bros can unblock or replace your drains, inspect drains with video cameras, repair or replace your stiff or leaking taps, repair your running toilet cistern, repair or replace hot water units, install gas services and appliances, repair roof leaks, replace guttering, install service and maintain thermostatic mixing valves and back flow prevention valves, install automatic flushing systems and much more. 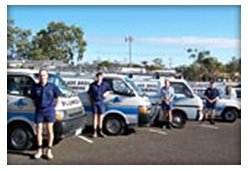 The Slade Bros Vision is to be recognised as the major plumbing services identity on the Northside of Brisbane. The business operation has been developed and systemised so that they can deliver a consistent, reliable service to meet all customer requirements. Slade Bros Plumbing were awarded membership into the prestigious Q400 in 2007 & 2008. Swiss company Geberit’s Life Cycle Assessment on supply pipes, analyses the environmental impact of various pipe types in Ecoindicator points (EIP99), according to the Dutch impact assessment method. From an ecological point of view, cross-linked polyethylene pipe performed the best (least impact). The cross-linked polyethylene pipe used by the “Enviro-Cottage” Project is supplied by Auspex. Auspex was formed in 1996 by Directors John Bines and Glenn Bines. A fully Australian owned company, Auspex has experienced remarkable growth in the relatively short time it's been in operation. Taking note of overseas trends in polymers and utilising many years of industry experience, Auspex began manufacturing cross-linked polyethylene pipe and a matching fitting system in DR brass. The system provided an Australian alternative to an ever-growing market for plastic pipes used to transport potable water. The company's success is largely attributable to its depth of experience in plastics and the extensive production knowledge of John Bines and Manufacturing Manager Bob Stratton. Their expertise has enabled the establishment of a start to finish cross-linked polyethylene pipe manufacturing operation that competes with the world's best. A commitment to the plumber and a focus on the way they use the product under everyday conditions has helped to drive innovation and set new standards in the plumbing industry. Plumbers also receive excellent support through distributors, Reece Australia and Auspex, with information and assistance easily accessible. Because Auspex's manufacturing operation is based in Australia, it can respond very quickly to the needs of its customers. This enables Auspex to rapidly develop new fittings and special short runs to satisfy unusual situations or changing market demand. The future is a very bright one for Auspex. The company is committed to remaining at the forefront of polyethylene pipe technology. New products and tooling are continually being developed for the existing system and the business is expanding into associated areas. It's this forward focus that will see Auspex continue to grow for a long time to come. For your nearest supplier and other information go to www.auspex.com.au, email ablair@auspex.com.au, or call (03) 9770 3600. McGinn Concrete is a family run business, with a passionate approach to exceeding customer expectations. The McGinn team specialises in domestic, commercial and industrial hand placed concrete works. McGinn Concrete has a commitment to the environment. Wherever possible they endeavour to use environmentally friendly products that meet the requirements of the Green Building Council of Australia's "Green Star" building code. McGinn Concrete have provided the polished concrete thermal mass floor for the “Enviro-Cottage”. For more information contact McGinn Concrete on (07) 3804 3022, email info@mcginnconcrete.com.au or visit www.mcginnconcrete.com.au. Queensland Complete Printing Services provides quality print solutions along with dynamic graphic design and print related services. By combining world class manufacturing processes, print excellence and design flair with innovative sustainability philosophies in the areas of environment, staff training and community participation they stand out in the crowd. Queensland Complete Printing Services works really hard to minimise the environmental footprint of the entire printing and production process. Queensland Complete Printing Services was the winner of the printing industry's 2007 Queensland Government Environmental Management award. Queensland Complete Printing Services offset presses use soy based inks. This biodegradeable alternative allows them to maintain a great print quality whilst using a much cleaner alternative than the oil based inks. Off their own roof they harvest 100% of the water used for the printing process. This saves the water in our dams for domestic use. Their short term goal is to become 100% green energy users. They currently use 20% green energy and envisage moving to 100% in the next three months. In Australia, 31% of energy used by the paper and pulp sector comes from renewable sources (biomass & hydro). A strong internal waste reduction program allows them to drive out waste through the entire production process. Reducing any waste is good for the environment. Queensland Complete Printing Services have a Responsible Paper Purchasing Policy, where they purchase only from paper suppliers that offer a range of stocks that are manufactured under strong Environmental Management Systems like ISO 14001 and Chain of Custody. As a participant of the Queensland Government’s EcoBiz program, which is an initiative of the Environment Protection Authority, Queensland Complete Printing Services are assisted in developing better ways to minimise their impact on the environment. Queensland Complete Printing Services support the 1000 TREES project where they are giving away 1000 trees to schools and not for profit groups to plant and nurture within their local community. Queensland Complete Printing Services are providing printing and professional photographic requirements to the Spring Hill "Enviro-Cottage" Project. For additional detail please refer to the Queensland Complete Printing Services Sustainability Report which provides more detail on how the "Enviro-Cottage" Project's innovative printing partner is planning for a sustainable future or contact Don Parry at don@qprint.com.au. The Spring Hill "Enviro-Cottage" Project has utilised Wagners ready mixed concrete for structural and retaining walls, pool structure, burnished concrete feature floors and to deliver the required thermal mass function. Wagners provides concrete to commercial and domestic customers throughout Queensland, from a number of major plants in Brisbane, Toowoomba and Townsville and smaller plants throughout South East Queensland. Wagners are a family owned, Queensland company. Established in Toowoomba in 1989 as a concrete and transport company with 20 employees, the company grew rapidly establishing and acquiring concrete plants and quarries throughout Queensland. The company now employs over 1000 employees worldwide and includes over 20 concrete plants, 6 quarries, a fleet of 300 trucks, major manufacturing facilities for both steel reinforcing and composite products and Project divisions that operate both in Australia and overseas. The group is currently undertaking a major expansion in the Brisbane area which includes the construction of one of Australia's largest concrete plants at Murrarie and a cement grinding plant on the Brisbane River. The Wagner philosophy has always been to provide the absolute best quality products and the highest level of customer service possible, with those products produced using safe and environmentally friendly work practices. Wagners pride themselves on using 100% of all the raw materials they produce and re-using any waste that results from their production processes. In 2007 Wagners were the first company in Australia to install the revolutionary Wastesaver unit which results in a dramatic reduction in fresh water used in the production of concrete and allows critical changes to be made to current industry practices by enabling the practical recycling of concrete solids. The Wastesaver unit results in a 100% improvement in the average harvesting capacity of rainwater, a reduction in the volumes of virgin aggregates required and improved product quality. While concrete is not traditionally considered an environmentally friendly product, its low maintenance cost, longevity and insulating and thermal properties make it a practical solution when constructing environmentally conscious homes. In addition to this when concrete's 'whole of life cost' is taken into account it is also an extremely economical building product. Wagners' believe in practicing responsible corporate citizenship, particularly in the area of environmental management. Recovering and recycling waste products while strictly adhering to licensing conditions, industry codes and regulations, are indicative of the strategies implemented by Wagners to avoid pollution of land, air and water. The company is committed to sustaining the environment in a healthy and safe manner for the benefit of future generations. Ready mix concrete - supplied in a range of strengths, Wagners supplies ready mix concrete in Brisbane from plants at Pinkenba, Wacol and Everton Park. A major project is currently underway to construct one of Australia's largest concrete plants at Murrarie on the Gateway Motorway, this plant will be serviced by a fleet of 10 wheeler trucks with 8m3 bowls, making it ideal for commercial and domestic supply. The Murrarie plant will be commissioned late in 2008. Pre-cast concrete - Wagners operates the largest permanent pre-cast concrete yard in Queensland at Wacol, adjacent to major transport routes. This yard has a flat table area, pre-stressing beds and a range of moulds enabling the production of a full range of pre-cast products. Steel reinforcing - Wagners supplies steel reinforcing, associated products and scheduling services from large scale manufacturing facilities in Brisbane, Toowoomba and Townsville. Quarry products - Wagners operates basalt, granite and sand quarries and has a full range of products including sealing aggregates, crusher dust, top soil, trap rock, concrete aggregates, road base, washed sand and decorative sand. Wagners Quarries also operates a fleet of mobile crushing and screening plants for project work. Transport - Wagners Transport division operates a fleet of almost 300 trucks, which are deployed at Wagner Plants and haulage projects. Composite Fibre Technologies - Wagners CFT produces a range of composite products, including road bridges, boardwalks, electrical cross arms and conveyors. This revolutionary product is lightweight, durable and 100% recyclable. 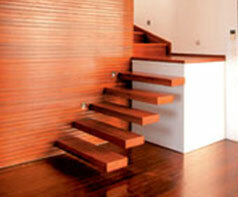 Composite products are being used to replace endangered hardwoods throughout Australia. The long lasting properties of composite products greatly reduce maintenance and whole of life costs making it one of the most sustainable civil construction products on the market. Visit www.wagner.com.au, call 07 3853 3600 or email brisbane@wagner.com.au for more information. The Salvage Company is the Spring Hill "Enviro-Cottage" choice for Recycled Australian Hardwood Timber for. The Salvage Company has provided the "Enviro-Cottage" with eco-sustainable, stable and durable hardwood timbers for flooring, decking and cladding applications. Jim Ruig of The Salvage Company has been sourcing and reclaiming recycled timber for builders, architects and environmental developments for over 20 years. The Salvage Company recovers wood from old wharves, bridges, woolstores, warehouses, old buildings and industrial factories and then re-mills it for any array of recycled timber applications from flooring to architectural to feature timbers. The Salvage Company is hands on for the entire process from sourcing the timber to its precision milling to the ultimate delivery for your project. The timber used for the “Enviro-Cottage” has been reclaimed from the old Alligator River timber Bridge south of Rockhampton on the Bruce Highway. Recycled timber has grown rapidly in popularity with more and more developments seeing its inherent benefits as well as its compliance qualities. Reducing the carbon footprint, offsetting destruction of forests and reusing timber that may have been left for the dumpster are just a few reasons to use recycled timber. Salvage supplies old growth tropical hardwoods that are amongst the hardest woods in the world and can last generations compared to just-cut alternatives. Recycled timber has improved characteristics and can be utilised by architects for its greater stability, richer colours and tight grain patterns. The timber brings with it a story, it's own history and a rich warm patina. For more information phone Jim Ruig on 0409 100 101 or email to sales@salvage.com.au or visit the website www.salvage.com.au. 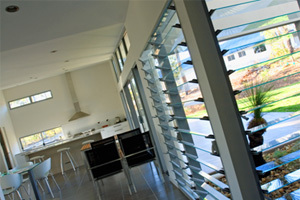 Fly Free has provided all the Retractable Fly Screens to the Spring Hill “Enviro-Cottage”. Fly Free offer an exciting, flexible and unique option for insect screening. Retractable Fly Screens allow you to have screening when you want or need it, with the option to retract them out of sight and out of the way when you don’t. The retractable screens have been installed in the “Enviro-Cottage” french doors and the traditional double hung sash windows. This allows maximum ventilation when needed, insect free nights when wanted, easy access to the sash windows to close or open them, and no difficult second storey external insect screen cleaning jobs. 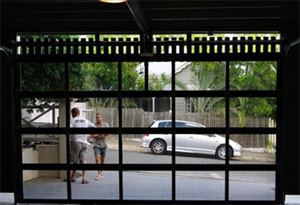 The Fly Free screens can be installed into door/window jambs or mounted onto architraves. They can be used to screen openings such as bifolds, french doors and entry doors, as well as screen casement, bi-fold, hopper, servery and double hung windows. Fly Free recognises our fantastic Australian climate and our love of comfortable, stylish living spaces, as well as the ever increasing importance we place on being environmentally conscious. 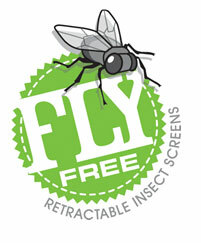 For more information on Retractable Insect Screens, contact Fly Free on 1300 881 680, email sales@flyfree.com.au or visit www.flyfree.com.au. The sun is a sustainable resource that in combination with a breeze offers us a free, gentle and natural alternative to the electric dryer. Electric dryers offer an energy using, environmentally unfriendly and harsh way of drying clothes. They can stress and destroy valuable garments, generate static electricity within them, and crush the clothing so they require ironing. Solar clothes dryers are the most natural and environmentally friendly way to dry clothes as it conserves energy, decreases greenhouse gas emissions and has the added bonus of saving money on the electricity bill and on time wasted ironing. The Versaline clothesline, an eco friendly alternative to the electric dryer, utilises a unique bracket mounting system that gives the homeowner unlimited control over where to place a clothesline to better suit their needs. Because of its disappearing and flexible length qualities, the Versaline clothesline offers a discreet clothesline that can be utilised in areas not normally considered for a clothesline. 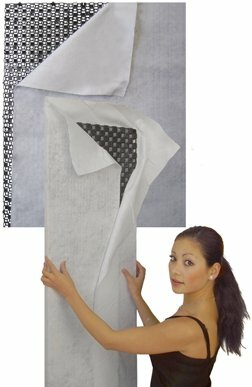 What makes the Versaline clothesline so unique? The Versaline clothesline offers the consumer the versatility of being able to install a clothesline where it best benefits their lifestyle. Traditional clotheslines usually dictate where they should be positioned in a household space and are limited in this area. The Versaline clothesline’s unique bracket mounting system allows the homeowner to dictate where to place their clothesline to better suit their requirements. The Versaline clothesline is easy to install in any size space, any length and removes in seconds when you need it to, allowing the homeowner to utilize this area for other purposes. The Versaline clothesline is normally installed onto the face of a wall or posts any distance apart, but can also be mounted onto curved surfaces, or perpendicular from a surface, at a 45° diagonal across a corner or onto round posts. With the introduction of an extra bracket and bar, the Versaline clothesline can be made longer than standard or installed onto three posts to cover a longer span. Duel drying positions is also possible with the purchase of an extra set of wall brackets. No other clothesline can offer the versatility and flexibility of the Versaline clothesline. The Versaline clothesline has the capacity of a large clothesline yet, because of its unobtrusive and removable features, it has an additional market as an undercover and internal clothesline closer to living areas. Protool has specialised in manufacturing, press metal tooling and general engineering as well as product development for clients, for over 10 years with the principle owner having 35 years experience as an Engineer. Protool is proud to be now developing Australian made products of their own which include the Versaline clothesline range. Protool is excited to be contributing to the Spring Hill “Enviro-Cottage” Project. Visit www.versaline.com.au for more information or send an email to info@versaline.com.au. “Well.... I am amazed. I ordered my Versaline 4pm Monday arvo. It arrived here on the north coast by 9am Tuesday morning and it was on my wall by 5pm Tuesday arvo!!!!!! It was the easiest installation I have ever come across and it looks great. I got rid of that bloody awful oversized and old hills hoist and I now have a much bigger backyard. The “Enviro-Cottage” uses an evacuated glass tube technology solar hot water system provided by Solar Lord. Evacuated glass tube technology was selected due to its efficiency and because solar exposure can be turned to heat regardless of the ambient temperature of the collectors. The inside and outside tubes are made from extremely strong borosilicate glass which are evacuated and fused together. The vacuum space between two glass layers forms excellent insulation to stop the heat loss from the inside to the outside. The outside of the inner tube is coated with the “Novel Sputtering” coating to absorb maximum solar energy. This coating was developed and patented at Sydney University. 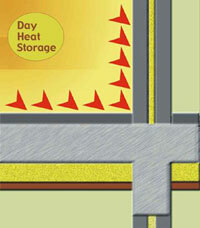 The keys to achieve higher efficiency are to maximize solar heat gain and minimize heat loss. Inside the inner tube, coating with absorptive material holds the copper tube where the water flows. The design of evacuated space between two glass tubes is to maximize sun’s ray gain and transfer the solar energy to heat the water inside the inner tube effectively. A vacuum is an excellent insulator to eliminate convective heat loss. 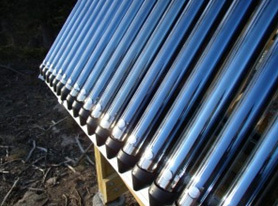 Flat panel solar collectors can produce a similar heat output to evacuated tube collectors, but generally only during warm, still, sunny conditions. When averaged over an entire year, evacuated tube collectors can be more efficient by 30%-80% than flat plate panel collectors. The cylindrically constructed evacuated glass tubes allow them to absorb sunlight perpendicularly from all directions. Solar Lord Evacuated glass tubes will pick up more solar energy from sunrise till sunset allowing them to achieve higher temperature and with greater efficiency. With flat plate panel, the sun is only perpendicular to the collector around noon each day. Therefore evacuated glass tube panels will pick up solar energy from sunrise till sunset which achieves both higher temperatures and higher efficiencies than flat plate collector. The “Enviro-Cottage” uses a U Tube collector, where the copper tube is bent into a U Shape (called a U tube) and inlaid into heat transferring fins. Both copper tubes and a pair of fins sit inside the evacuated glass tube. When sunlight strikes the collector the solar radiation goes through the clear glass of the outside tubes and is absorbed by the coating on the outside of the inner tubes. The solar energy is changed into heat energy by the coating surface and heats the inner tube. Encircled by the inner glass tube the fins transfer the heat from the absorbing surface of the inner tube to the copper U tube. Water flows inside the copper U tube and is heated and piped to the storage tank, where it is kept until needed. Click on the graphic below to play a video which helps explain further this process. 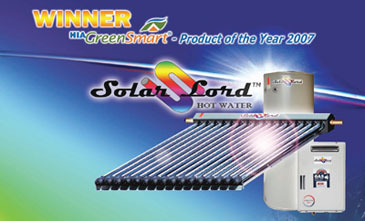 For more information contact Solar Lord on 1300 133 782, email info@solarlord.com.au or visit www.solarlord.com.au. 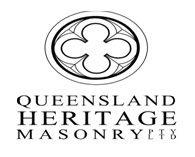 Queensland Heritage Masonry are stone masons committed to building and preserving Queensland's history. Based in Brisbane, Queensland - Queensland Heritage Masonry's objectives are to incorporate the craft of stonemasonry, heritage conservation and modern requirements to provide an integrated approach for all clients. Heritage conservation is a delicate process, which often requires specialised skills. 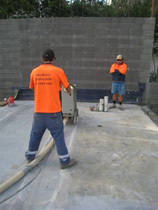 Queensland Heritage Masonry has experienced tradespeople with both contemporary and traditional skills. Queensland Heritage Masonry source, process, manufacture, deliver and fix on site to the highest quality standards. Works are carried out in many different mediums including Granite, Sandstone, Marble and Brisbane Tuff. Projects are conducted in major centres and all regional areas of Queensland and New South Wales. For more information visit www.qhm.com.au, call (07) 3393 9166, or email info@qhm.com.au. Majestic Pools has led the industry with a range of "sustainability and conservation" technology developments. From products such as the "Backwash Recycler" to spearheading the now SPASA-wide concept of "EcoPool" self sufficient swimming pools, and commercialising Ozone/freshwater pool systems. Majestic Pools is also heavily involved with developing further water, energy and chemical saving technologies, some of which may be incorporated into the Spring Hill "Enviro-Cottage"Project. Majestic Pools & Landscapes have partnered with Astral/Hurlcon Pool and Spa Equipment in the development of a range of these products, and also further major developments in the way of sustainability and "eco-friendliness" in the pool and backyard. Majestic Pools & Landscapes is one of Australia's largest concrete pool builders and designers, building more than 750 concrete pools each year. Established in 1986 by Jack and Lydia Jakovac, the company employs ten designers and six project managers. The company takes pride in its well-equipped design team, which specialises in full concept and custom outdoor designs, including sustainability and EcoPool aspects. Majestic Pools & Landscapes has two showrooms: one in Chandler and the other in Albany Creek. The company builds pools along the Queensland coast from the New South Wales border up to the Sunshine Coast and as far west as Toowoomba. The team at Majestic Pools & Landscapes also designs for the Sydney, Melbourne, American, Middle East and European markets. Majestic Pools & Landscapes was one of the major winners in the 2008 SPASA Queensland annual awards, taking away 22 awards including Pool Builder of the Year. The company is also a gold award winner in the national SPASA awards. Its many accolades are testament to the high-quality finished product provided. For more information visit www.majesticpools.com.au, call (07) 3245 2111 or email mail@majesticpools.com.au. 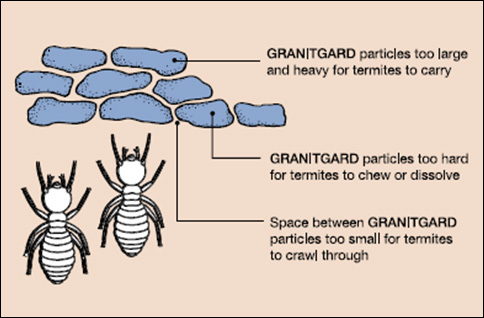 Granitgard is the Spring Hill "Enviro-Cottage" choice for long-life non-toxic termite protection. New buildings can be protected from termites with one treatment of natural, non-toxic, Granitgard graded stone physical termite barrier material. This treatment is easily applied during construction and could save the building from destruction. With a wide range of simple installation methods that are fully approved, Granitgard can protect all common building designs. Granitgard offers long-life, one system termite protection without the worry of toxic chemicals, building schedule delays and on-going retreatments. Because Granitgard remains visible, it is easy to determine whether an area has been properly protected. Granitgard's flexibility means that it will remain effective when the building's service connections, footings, foundations and walls expand and contract. Granitgard allows building components to move independently without breaking the termite barrier or cracking walls, footings and pipes. The natural stone material used to make Granitgard is a by-product of concrete and road sealing aggregate crushing. That portion of quarry output which is too fine for other products is re-processed to make Granitgard. Crushing, screening, vacuuming, packaging and delivering the volume of Granitgard required to treat one home uses very little energy and has low environmental impact. There are no chemicals added to Granitgard. Installing Granitgard in a building actually reduces that structure's energy demand because Granitgard also helps to insulate the underside and perimeter of concrete slabs. A 100mm layer of Granitgard has an "R" value of 0.6. Being a once-only treatment the efficiencies of Granitgard termite barriers multiply over time as other systems require re-application or replenishment. The strip shielding materials used as part of the Granitgard System are manufactured. PVC strip shielding is made using some recycled plastics. Like the Granitgard graded stone, strip shielding can be re-used. Granitgard Pty Ltd's research and development efforts, in collaboration with the CSIRO, continue to refine sustainable termite protection techniques to better meet the requirements of architects, engineers and builders. Investigations into the use of lower impact recycled materials for Granitgard strip shielding and penetration collars are examples of the company's innovative approach. Such innovation and flexibility ensures that Granitgard continues to be the responsible choice for termite protection. Visit www.granitgard.com.au or call 1800 032 549 for your nearest GranitGard provider or email sales@granitgard.com.au. CTM Springwood has provided Australian made vitrified floor tiles to the Spring Hill “Enviro-Cottage”. CTM has available one of the larger ranges of Australian made tiles in Brisbane. Buying Australian made tiles supports the local manufacturing industry, protects Australian jobs and minimises the transport miles, providing an overall embodied energy advantage. For more information contact CTM Springwood on (07) 3208 3472, email Springwood@ctmtiles.com or visit www.ctmtiles.com. Greenbins is a privately owned and operated Brisbane skip bin company providing a high level of service to both homes and businesses throughout the Greater Brisbane area. They have over 500 bins, 10 trucks and are expanding year on year. They pride themselves on prompt, efficient and friendly service, to provide for your entire waste disposal needs. Greenbins respects the environment, so they aim to reduce the amount of waste sent to landfill each year. Their facility has the resources to sort and recycle most re-usable material and where not possible they use only respected recycling stations within Brisbane. Do the right thing use greenbins! For more information visit www.greenbins.com.au, call 1300 656 624 or email greg@greenbins.com.au. Davey Water Products have provided all “Enviro-Cottage” water pumping and filtering systems. Australian owned, Davey have manufactured pumps and pressure systems since 1934. They export to more than 60 countries. The Davey product range is suitable for many industrial, rural and domestic applications. In this case the Davey domestic product set meets all of the quite complex functional and environmental requirements of the Spring Hill “Enviro-Cottage” Project. The rain and greywater management system components in the “Enviro-Cottage” include 4 underground tanks, 4 Davey pumps, 2 Davey Rainbanks and 2 Davey water filter systems. 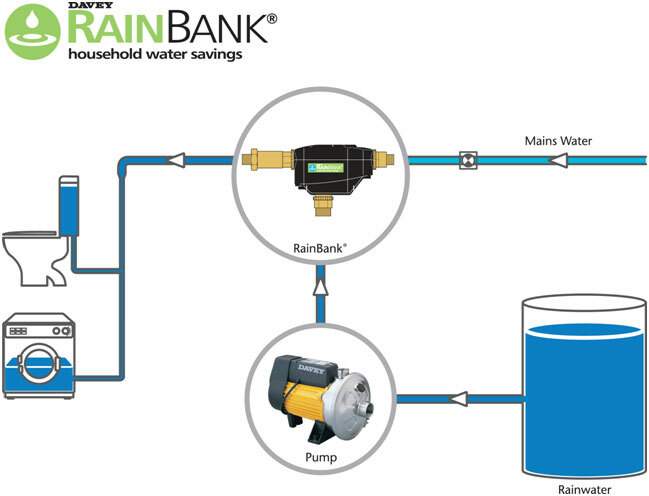 The Rainbanks are used to ensure the most appropriate quality and available water supply is utilised every time, as per the diagram. At least every 24 hours, the greywater in the holding tank is passed through the greywater processing system producing grade A+ output water. If the system is ever offline a Davey pump sends excess greywater to the sewer line. The output water from this system is stored in a 4,000 litre underground tank, fitted with a Davey sump pump. Rain falling on the roof or in the central courtyard is directed to a 23,000 litre underground rainwater tank, fitted with a Davey sump pump. This main tank is also connected via overflow to a 3,000 litre under garden tank. For more information on Davey products visit www.davey.com.au, call 1300 367 866, or email sales@davey.com.au. The Spring Hill "Enviro-Cottage" Project has utilised Atlantis ï¿½ Matrix ï¿½ tank modules, underground rainwater harvesting, detention and infiltration tanks. The Atlantis underground tank system is a modular sub surface system that can be constructed to hold any volume required. The sub surface location of the tank frees up space for landscaping or driveway use while also ensuring optimal conditions for retaining water is always maintained. 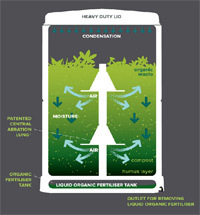 All macro and micro pollutants are completely kept out of the system through an Atlantis Filtration Unit. Established in 1986, Atlantis Corporation Pty Ltd has become the leading international provider of water sensitive urban design solutions in the field of stormwater management, collection and purification. With offices and partners around the world, Atlantis integrate consulting, technical services and the supply of innovative technologies to develop total environmental solutions for urban stormwater management. Atlantis’ objective is to create sustainable environmental solutions for stormwater management, turning major environmental problems into rejuvenated assets that enhance water quality and reduce or eliminate contaminated water discharge into our rivers and oceans. The Atlantis system guarantees compliance with environmental regulations, thereby avoiding costly legal cases. Our strategies include partnering with customers to develop the specific customised solutions, anticipating and meeting their development needs while, at the same time, repairing or protecting the environment in a manner which makes economic sense for all parties involved in urban development. Atlantis incorporates all environmental considerations when analysing development design. Their multi-skilled team of environmental engineers, landscape architects and biologists work together to solve customer’s problems in an ethical and holistic way. 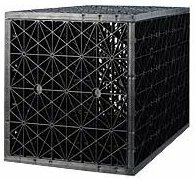 The Atlantis® Flo Cell is an ideal structural and lightweight system designed for Planter Box and Roof Garden applications. 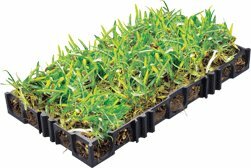 The Atlantis® Flo Cell allows optimal growing conditions for vegetation through ideal moisture conditions and aeration. Only excess water is removed and the soil profile retains a high moisture content. 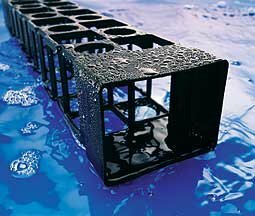 In addition the Atlantis® Flo Cell features water storage cups used for passive irrigation and due to the structural design of the cell, a void space is created, providing aeration and promoting growth for root systems. The Atlantis® Flo Cell will also function as a protective membrane for waterproofing on concrete slabs, walls and provide ventilation for concrete slabs, alleviating heat induced stress and cracking. 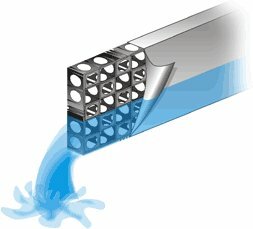 The Strip Filter Pipe is a modular, hollow structure with male to female connection at alternate ends. Compared with traditional slotted pipe it has superior crush strength and a significantly higher infiltration capacity due to the void surface area of over 80%. The cellular wall drainage system provides a permanent structural cavity to relieve hydrostatic pressure and control water seepage. Perfect for underground car parks, basements, retaining walls and seepage cut-off trenches. 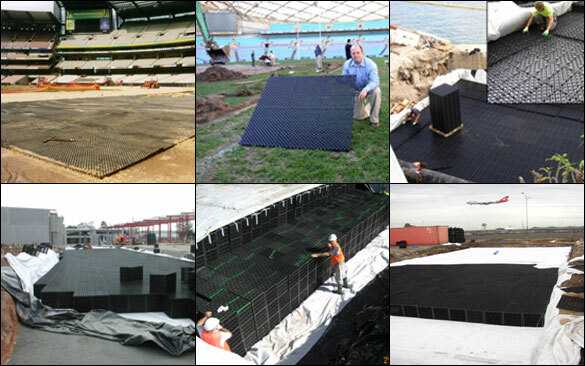 Atlantisï¿½ Turf Cellï¿½ A patented HDP grid structure designed to reinforce and stabilize turf grass in a range of applications. The system provides simple, fast and low-cost installation and is suitable for both flat and sloping surfaces. Atlantisï¿½ Gravel Cellï¿½ Provides heavy load-bearing support and containment of gravel to create a porous pavement surface. When used with proper porous base course material, Gravel Cell acts as a filter medium for gross pollutants, allowing the stormwater to be treated before flowing into a storage area utilizing Atlantis Matrix tanks. Gravel Cell minimizes stormwater runoff, inhibits weed growth and acts as a permeable pavement surface. The Flo-Grid™ permeable paver revolutionizes the ancient curb & gutter drainage system. The Flo-Grid™ permeable paver allows the infiltration of stormwater along the entire length of the road, directing stormwater to naturally infiltrate into the ground below, recharging natural aquifers. By replacing impermeable curb & gutter drainage system, the Atlantis system reduces stormwater runoff, streambank erosion and contaminated waterways. Atlantis Channel System: Bio-Swale - The Atlantis channel system is based on permeable sub-surface waterways that recharge the ground water table with clean water and reduces erosion. The Atlantis Bio-Swale can be designed to follow contours of landform, landscaping, and emulate the flow of natural waterways. In 1980, motivated by the mission to improve the cities of the world, Humberto Urriola and a small team of people who had the same beliefs, set out to change the way we managed water. Many of today’s water technologies are based on a system developed by the Roman Empire some 2,000 years ago. We hope these days never eventuate. According to Humberto: “To dominate nature, we have to respect it.” A philosophy shared by many environmentalists right around the world. As we are all a part of the world’s living environment, we are responsible to fix the things that contaminate our home. We must think: “Environment First”. This is one of the cornerstone messages preached by Humberto. His ‘Atlantis’ philosophy of healing the planet and stopping environmental degradation should take place in a variety of forms. His driving desire to protect the environment resulted in his unique, internationally acclaimed invention: the Atlantis Drainage Cell. The first real change in water management in over 2,000 years. His invention of an ecologically sustainable and environmentally friendly water management system is based on nature itself: let water fall where God had intended it to and manage it at point source. “Make your home and your life a little bit greener and you will see positive results,” he says. Our architecture, the way we build cities, the way we manage water and air all has to change. If not, the Earth will not recover from centuries of degradation and environmental mismanagement. Our civil engineers, architects, builders and governments must change their way of environmental thinking. Global warming, floods, droughts and killer storms are a result of man’s lack of understanding the environment. Our cities are an impermeable cover over the earth. They stop water from penetrating the ground, they create hot thermal plumes that lead to global warming and they are the source for disease and contamination of the environment. For more information go to www.atlantiscorp.com.au or email info@atlantiscorp.com.au. Breezway specialises in products that bring light, air and a sense of space to the built environment. Altair Louvre Windows by Breezway were selected by the Spring Hill "Enviro-Cottage" Project to be installed within G James Glass window frames. Maximum ventilation: With no fixed panes and blades that open almost horizontally, Altair Louvre Windows are twice as open as regular windows to allow a home to maximise fresh, cooling breezes. Tight sealing: Altair Louvre Windows seal over 8 times better than the Building Code of Australia's mandated sealing criteria for residential windows. This means that cooled air leaking out of windows in summers and cold draughts in winter need no longer be a concern. Choice of glazing: The glazing used in Altair Louvre Windows can be customised to meet the needs of the local climate. Toned glass can be used in hot climates to reduce the amount of warm sunlight entering the home. In cold climates, clear low-e glass can be used to improve the insulating properties of the window, while still allowing the warmth of the sun to heat the home. Or you could follow a trend from Far North Queensland and use timber blades to provide shading and good insulation from hot summer days. As each Altair Louvre Window is custom made at the Breezway factory in Coorparoo, Brisbane, a high degree of customisation is on offer. Handle types, positions and colours, blade sizes and materials, security options, colours and window configurations can all be customised to meet individual needs. For more information visit www.breezway.com.au, call 07 3847 0521 or email Kathleen.limerick@breezway.com.au. Aneeta Window System's sashless windows are a popular choice with architects, interior designers and the home owner because they deliver the look of fixed glass with the practicality of a window. Best described as two panes of glass which overlap when opening or closing, the simplicity and sleek look define why the windows are referred to as "sashless". Aneeta Windows are unique in that their simple and patented standard 2 pane unit is a vertically counterbalanced double hung window where the top and bottom panes move concurrently. This provides for adjustable room ventilation, crucial to the Spring Hill "Enviro-Cottage" ventilation and passive design brief. The Aneeta sashless windows have multi-positional locking and will be keyed alike throughout the Spring Hill "Enviro-Cottage" for increased security. Aneeta Windows has grown since 1994 and now operates independently in Melbourne, Sydney, Brisbane, Perth and Adelaide. For peace of mind, Aneeta Windows Sashless window inserts are guaranteed against defects arising from faulty workmanship or material for a period of seven (7) years from the date of installation. What is a Sashless Window? Aneeta sashless windows are a modern alternative to traditional openable windows. Sashless windows are a double hung system that feature two moving panes of counterbalanced glass, without the bulk of a timber or aluminium sash frame surrounding the glass. This provides the best-uninterrupted view in opening window design available today. The windows open at both the top and bottom with one easy motion to provide perfect rotational ventilation. 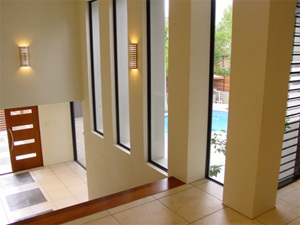 For more information visit www.aneetawindows.com, call (07) 33999666, or email sales@aneetawindows.com.